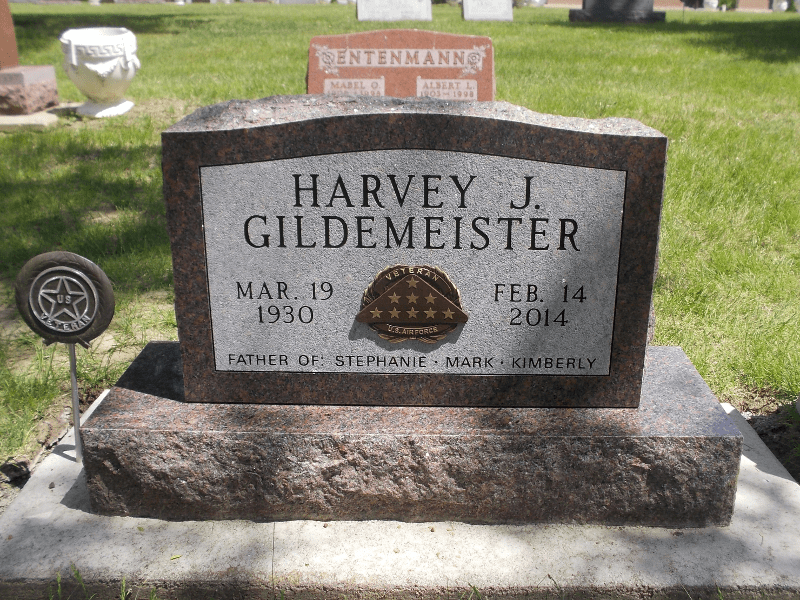 Working with our country’s military veterans is one of the greatest honors we have here at Family Memorials by Gibson. Creating a beautiful monument that tells their stories and recognizes the sacrifices they have made for our country is truly meaningful work. 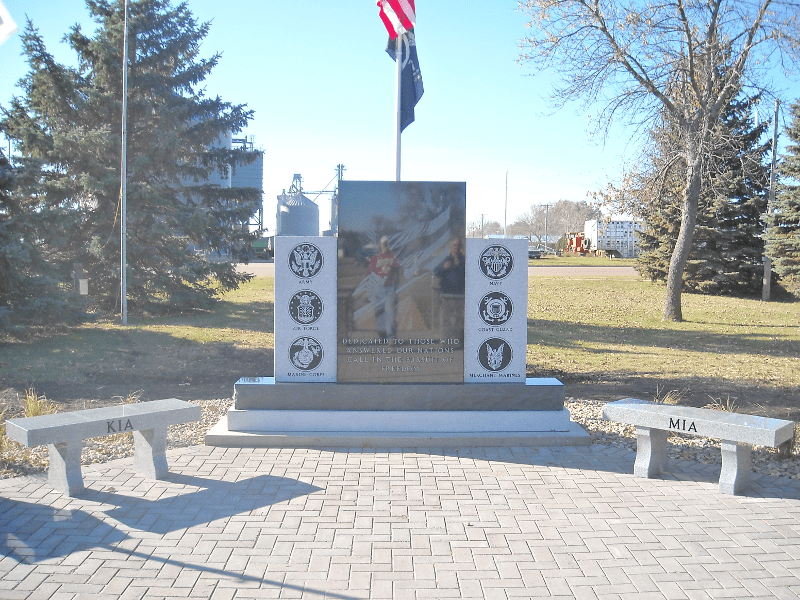 Thanks to the VA and the federal government, most veterans are eligible for a free memorial. That being said, there is often confusion regarding what exactly this means for and how they can take advantage of this government benefit. 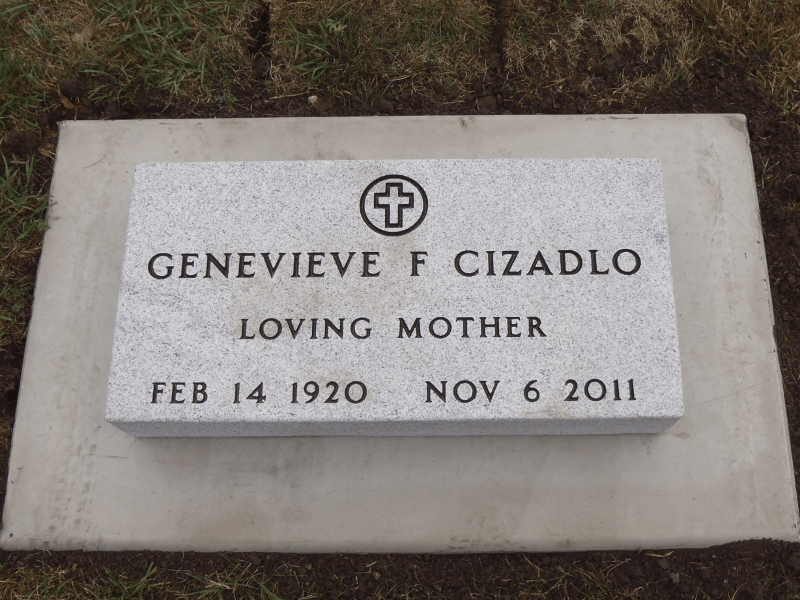 In this post, we’ll show you what types of memorials you are able to order from the government for free, how you can incorporate the government memorials into your own privately purchased stones, some alternatives to the government provided memorials, how we can create matching monuments for spouses, ordering a pre-need monument, and, finally, we’ll show you how we can facilitate the application process by taking care of the paperwork for you! Let’s start by looking at the options available at the government’s expense. 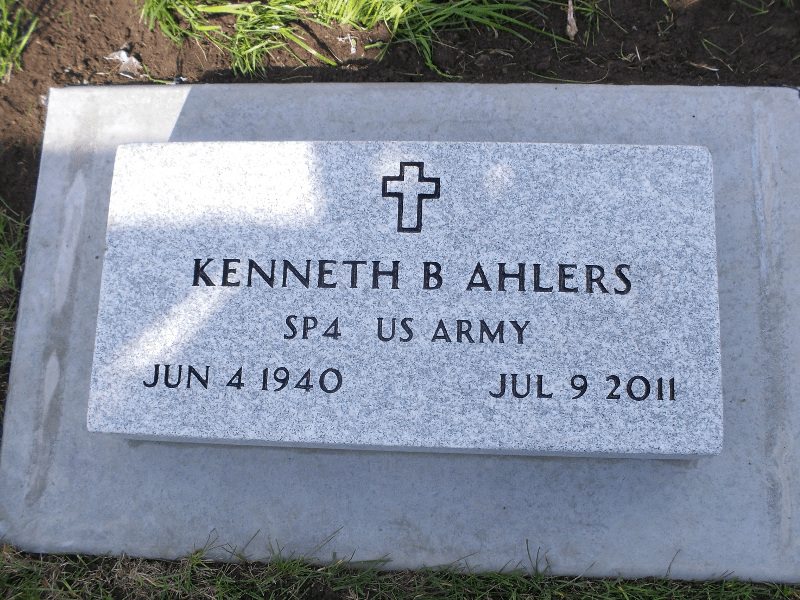 This option for the government headstone measures 42 inches long, 13 inches wide, 4 inches thick, and weighs approximately 230 pounds. You are able to choose between marble and granite (we would generally recommend granite because marble is softer and wears away more quickly, especially in the dusty and windy Midwest). 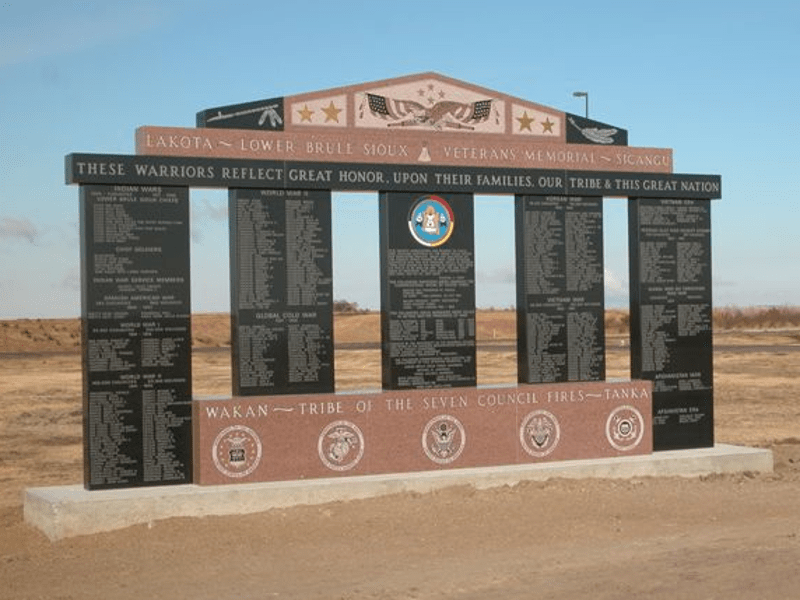 This is the type of monument that you will recognize from most military cemeteries across the country. 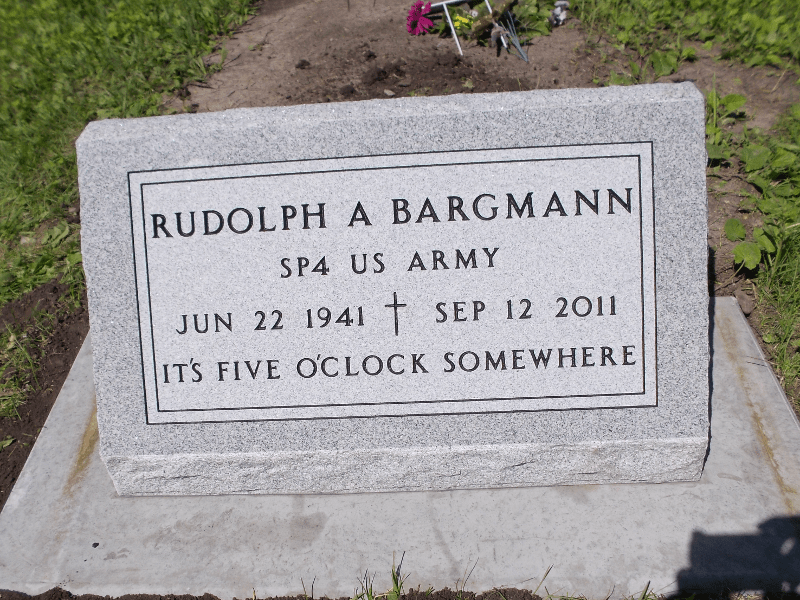 This option is a government headstone marker measuring 24 inches long, 12 inches wide, 4 inches thick, and weighs approximately 130 pounds. Again, you are able to choose marble or granite, but we’d recommend granite (see above). 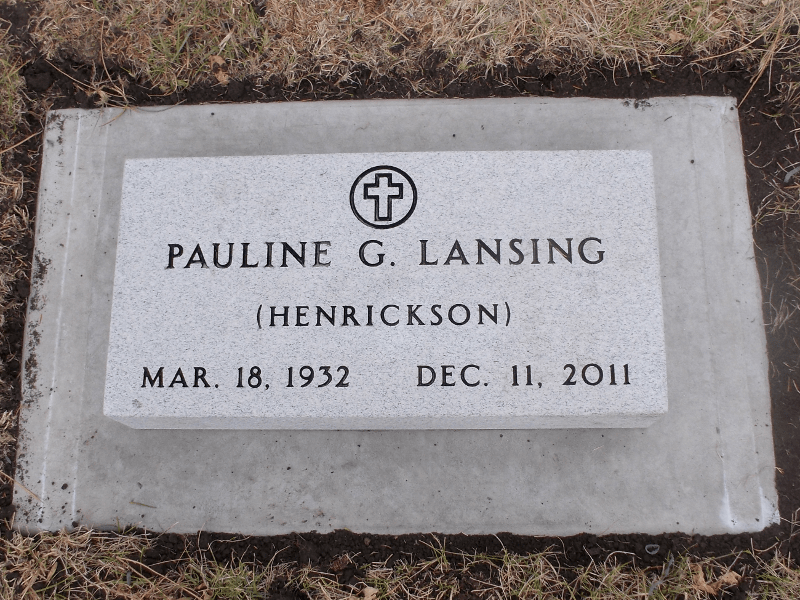 This stone is most commonly used as a footstone on a cemetery plot that also has a larger, privately purchased monument at the head of the grave. 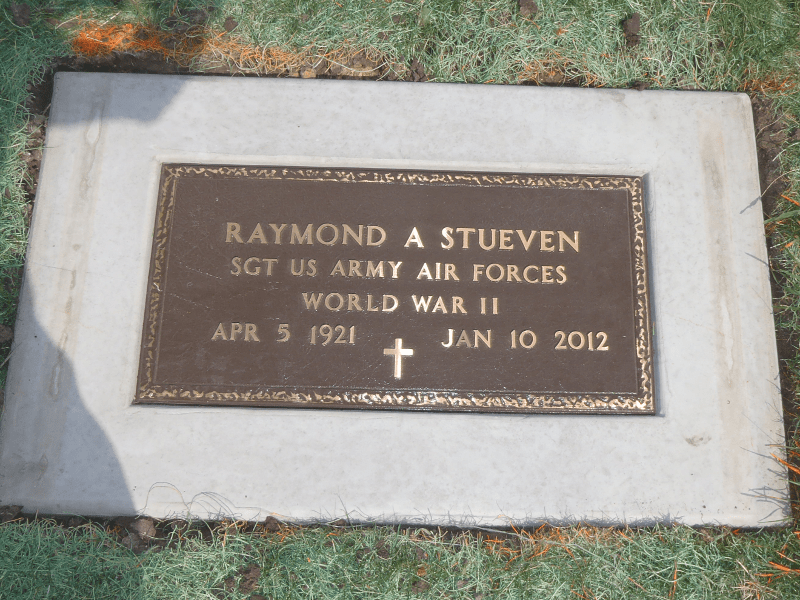 The large bronze plaque is the most commonly chosen option among the veterans we work with. It measures 24 inches long, 12 inches wide, ¾ inches thick, and weighs 18 pounds. It comes with anchor bolts, nuts, and washers for attaching it to a base (base is not included). The niche plaque is smaller and measures 8.5 inches long, 5.5 inches wide, 7/16 inch thick, and weighs 3 pounds. It comes with bolts and washers for easy mounting on a base, monument, or wall. 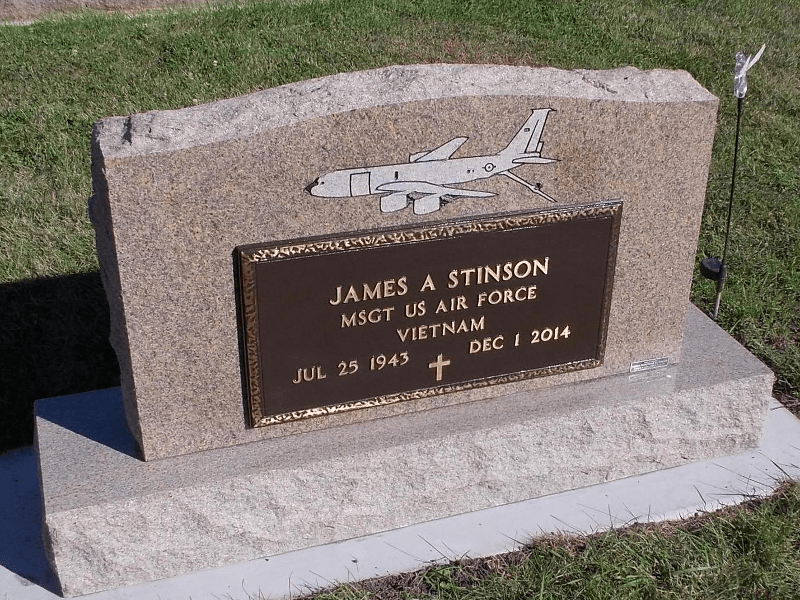 Believe it or not, you are granted a bit of leeway when it comes to what is inscribed on your US government grave marker, monument, or plaque. 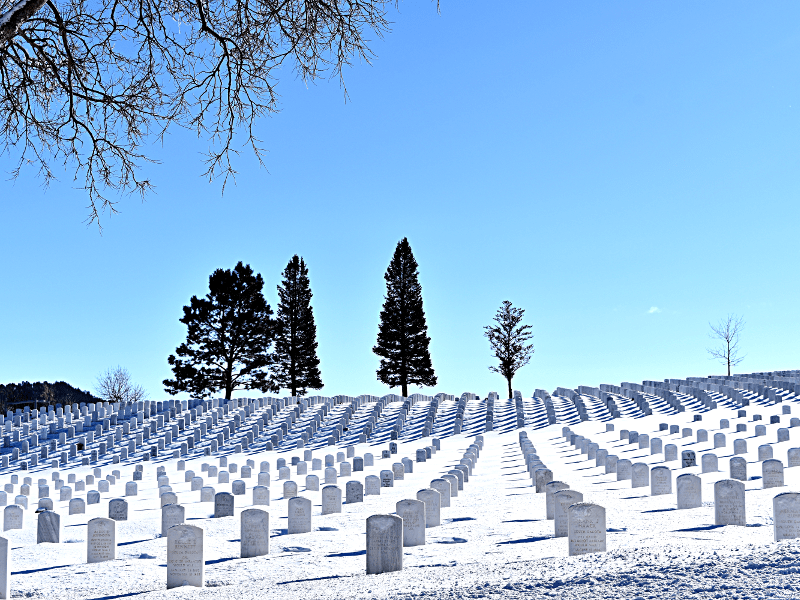 Mandatory Inscriptions: Every monument must include the veteran’s legal name, branch of service, year of birth, and year of death. 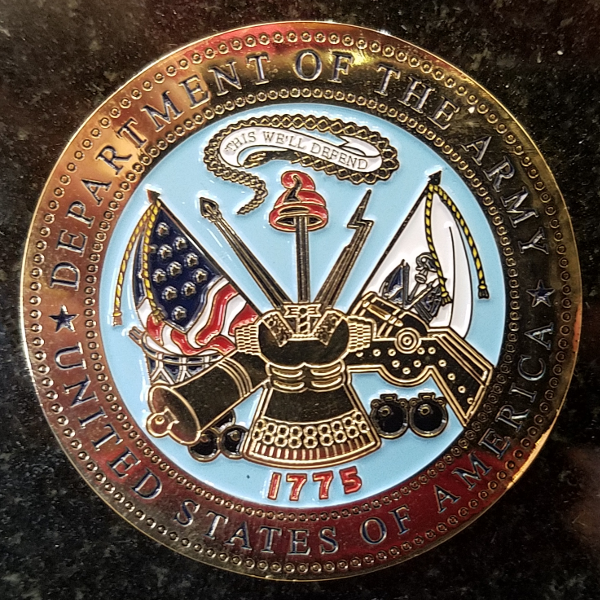 Optional Inscriptions: You are also allowed to include, if you choose, the month and day of birth, month and day of death, highest rank attained, awards received, war service, and emblem of belief (See emblem options). 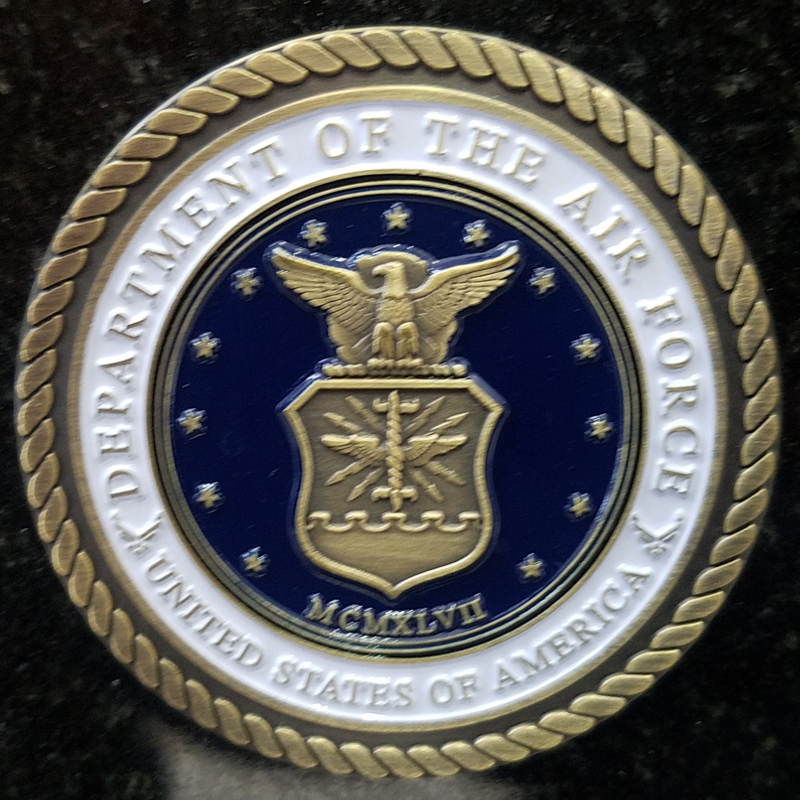 If space allows, you may also be able to include terms of endearment, nicknames, military or civilian credentials or accomplishments, or special unit designations. The final options available from the government are bronze medallions. 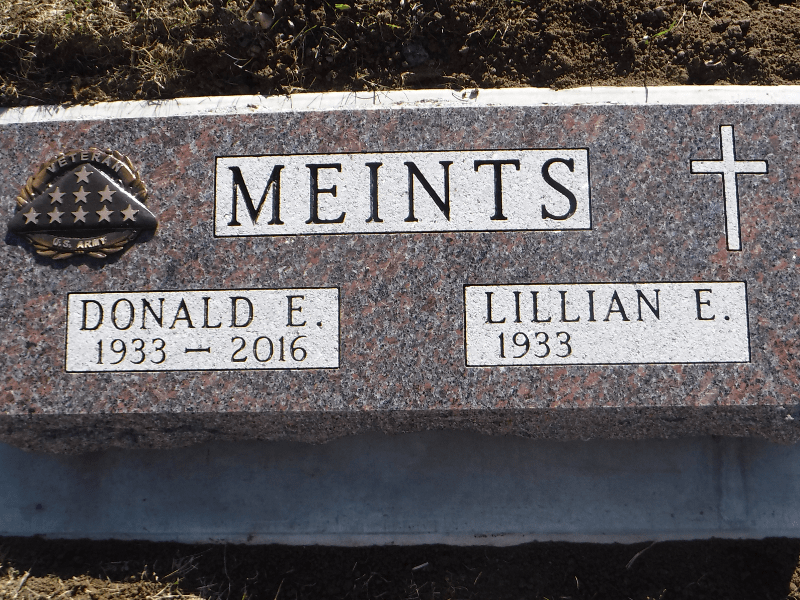 These medallions must be attached to a privately purchased headstone and are a great option if your cemetery only allows one monument per grave, which prevents you from using the free government marker as a footstone. You are not able to utilize this option for free if you are taking advantage of any of the other free monument options. However, if you would like, you can purchase these in addition to your free choice. 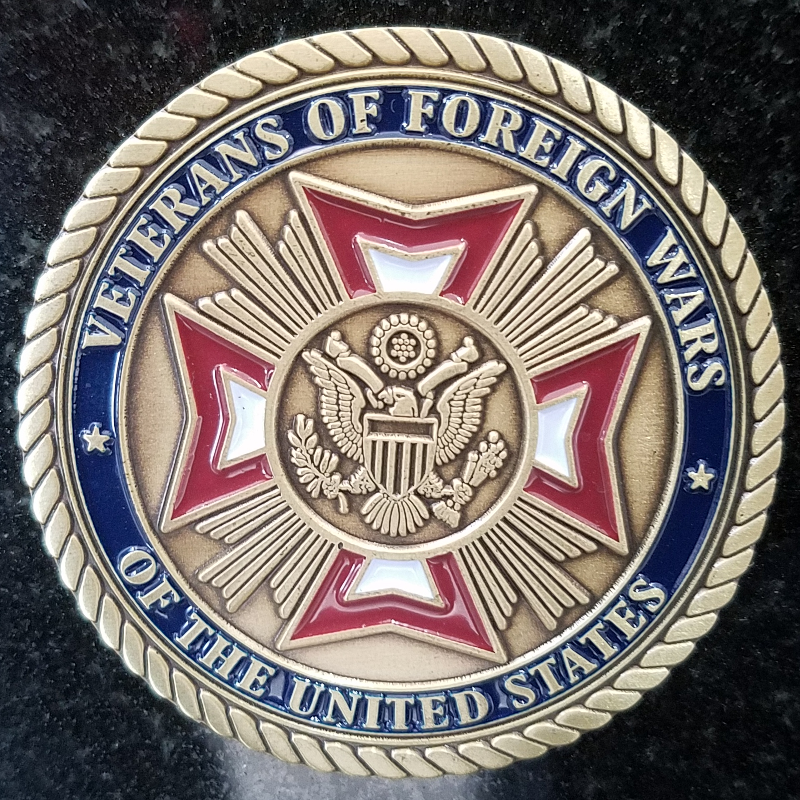 Every medallion is inscribed with the word “veteran” across the top and the veteran’s branch of service along the bottom. 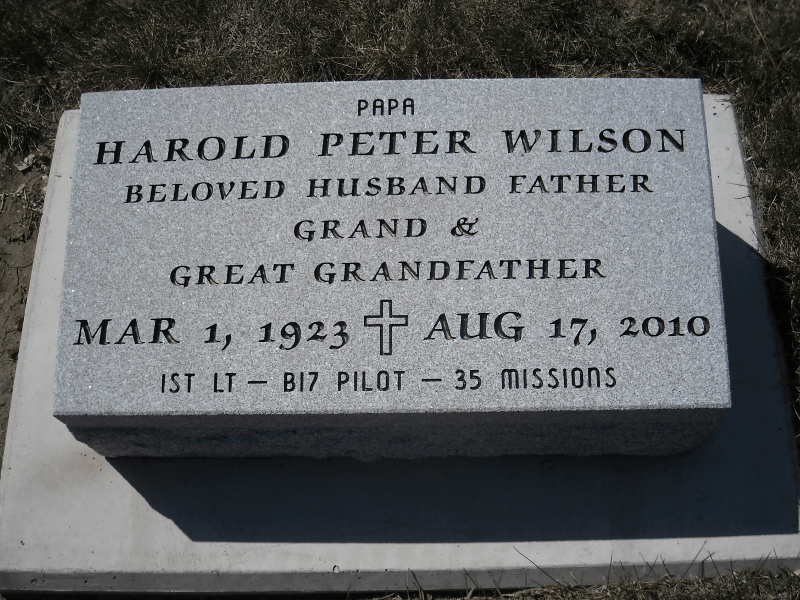 As we mentioned earlier, the large bronze plaques are the most popular government option we see, closely followed by the bronze niche plaque and the bronze medallions. This is most likely because these options can be easily incorporated into a larger, privately purchased stone. 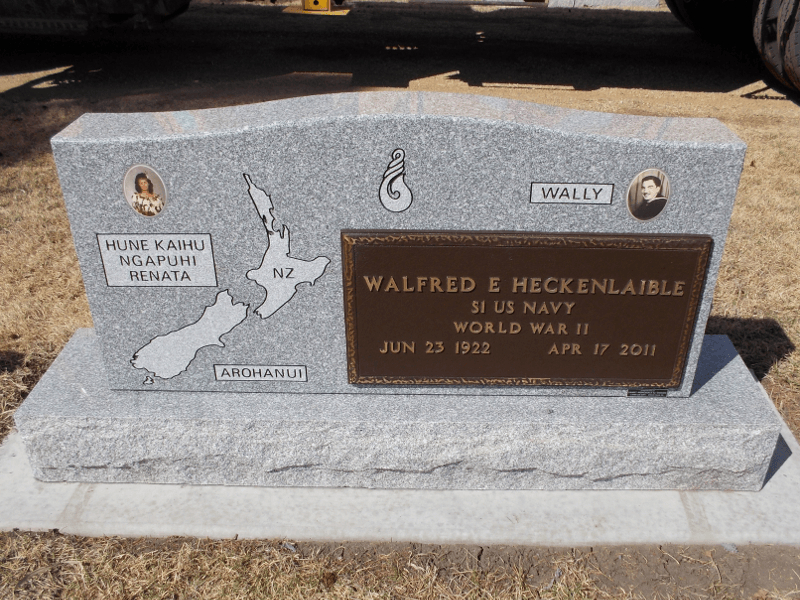 Large bronze plaques are most commonly mounted on the back of an upright monument or a slant. They are sometimes mounted on a marker or grass marker. 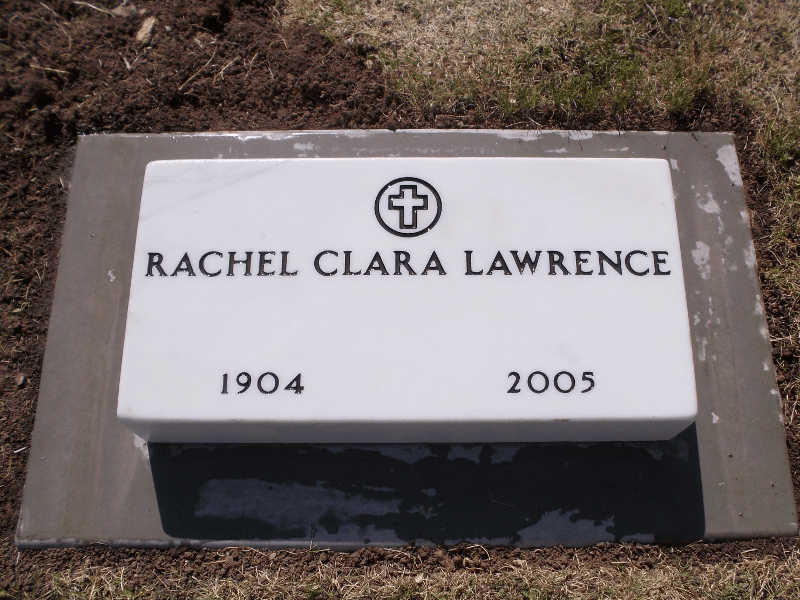 Niche plaques and medallions are small enough that they can be incorporated into the design of the stone. 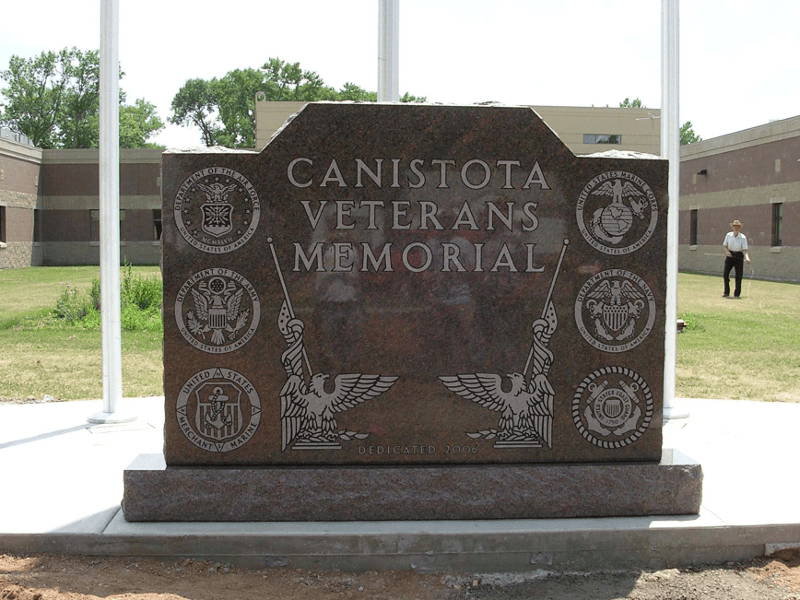 They are often mounted on the front of the stone above or near the name of the veteran being memorialized. 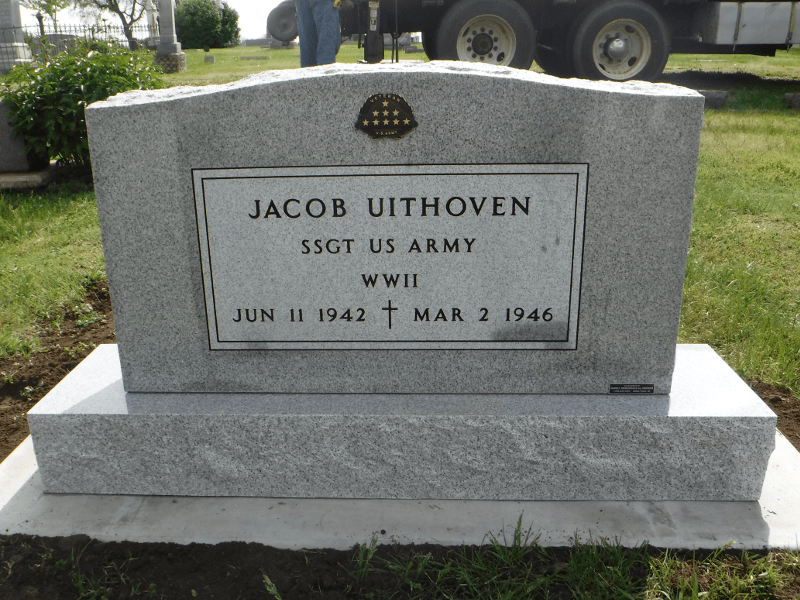 While the standard government headstone markers are great, especially since they’re free, they are a bit limited in what they allow, both in colors and inscriptions. If you want something that honors you or your loved one as a veteran, but the standard government options are not quite doing it for you, we have options for you as well. Many times, families will ask us to mimic the font and format of the government options and blast it directly into the stone. 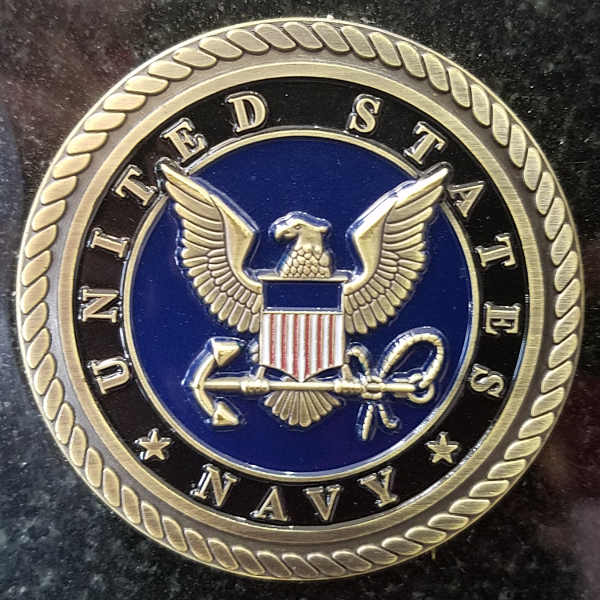 This allows them the freedom to include any information they want while still referring to the recognizable military look and feel. 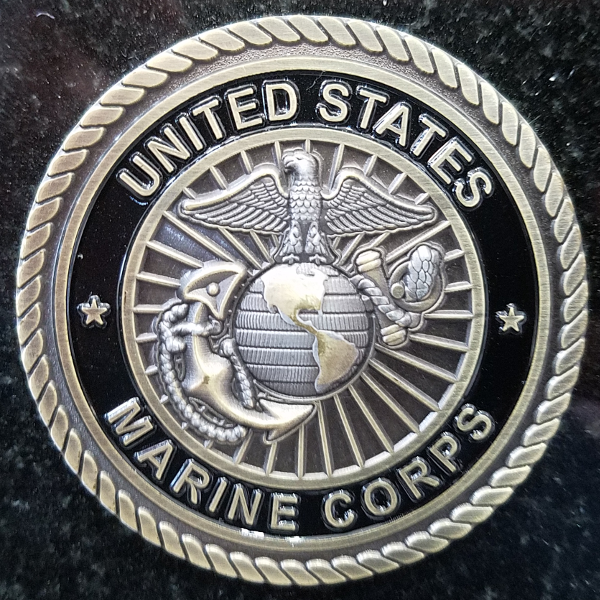 An option/alternative to the bronze medallions provided by the government is to choose one of the military emblems we can in-set in your stone. 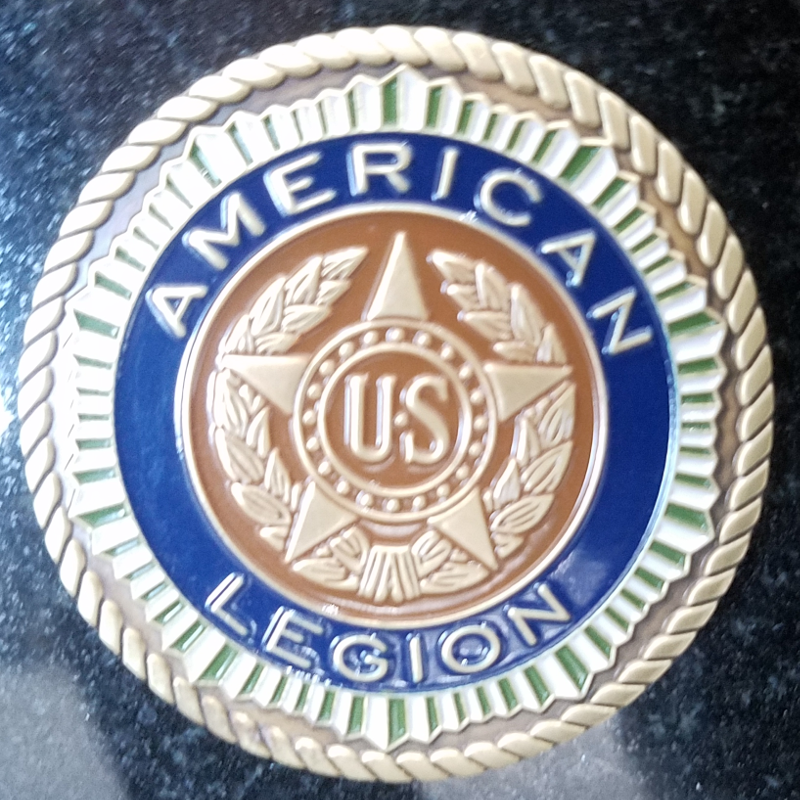 These are beautiful, colored pieces that are customized for each branch of service. They typically include that branch’s seal and motto in great detail. 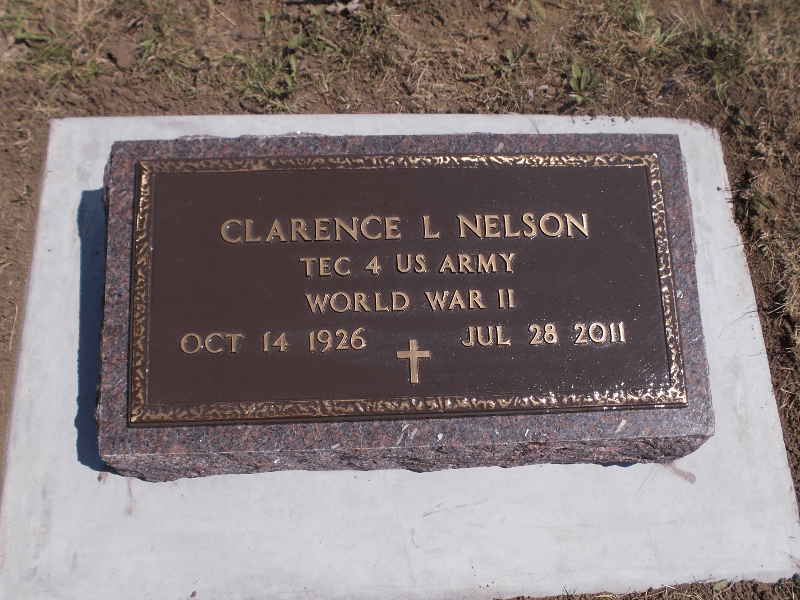 We also have many married couples who desire to have matching stones or large bronze plaques, but only one of them is a veteran. The government doesn’t provide free options for spouses. Fortunately, we are able to match anything the government does to a tee. 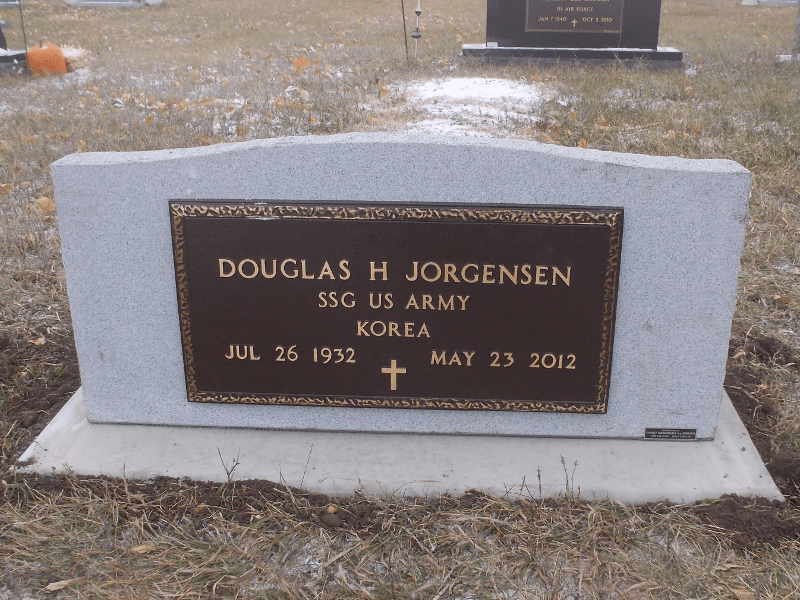 We can either order a bronze from a private company that will match the veteran’s plaque so they can be side by side or we can manufacture a marble or granite stone that perfectly matches the government issued stone or marker. What About Ordering Pre-Need Stones? It’s easy. We simply go through the process as normal. 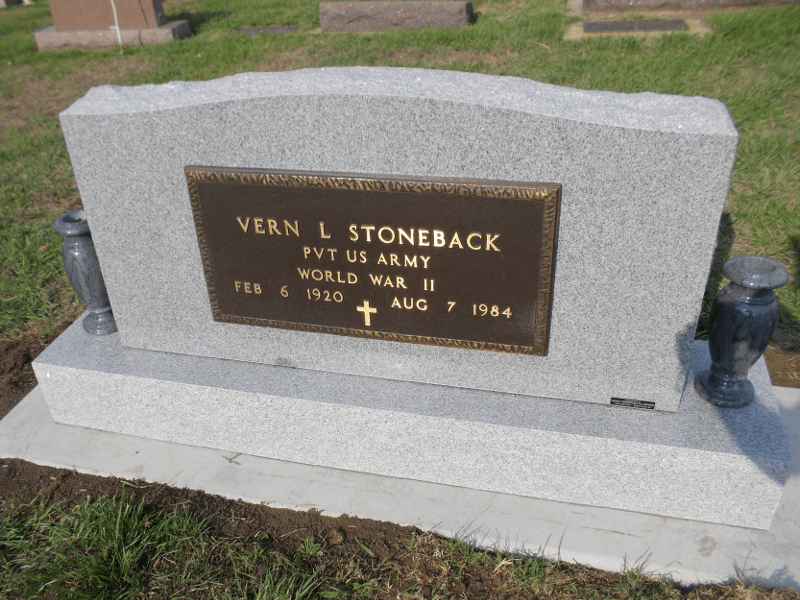 When the veteran being memorialized does pass away, we’ll write up a new contract, get the bronze ordered, and mount it to their monument out in the cemetery. Applying for this government benefit requires the paperwork to be filled out correctly the first time, otherwise, there can be lengthy delays (imagine that). 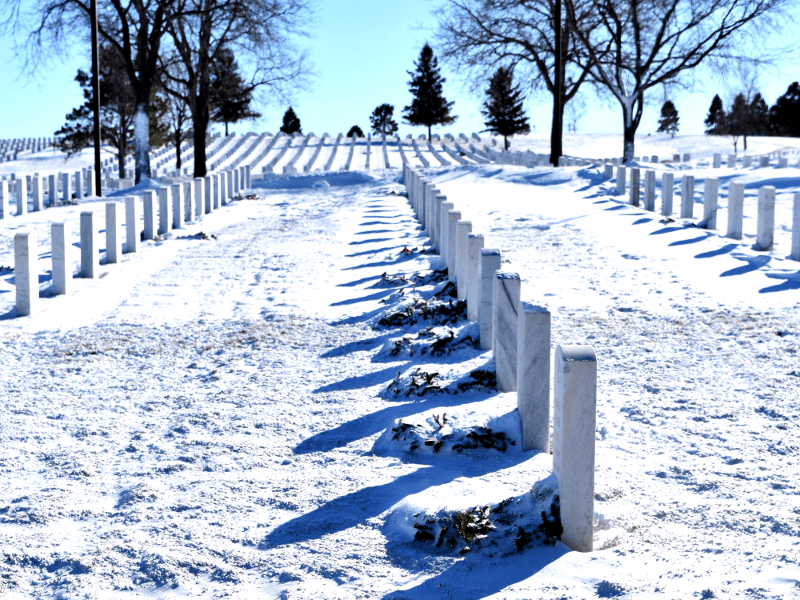 As part of our service to our veterans, as long as we are provided with their discharge papers, we are more than happy to submit the government headstone application for you and all of the associated paperwork. We have applied for this government benefit on behalf of thousands of veterans, so we know what we’re doing. 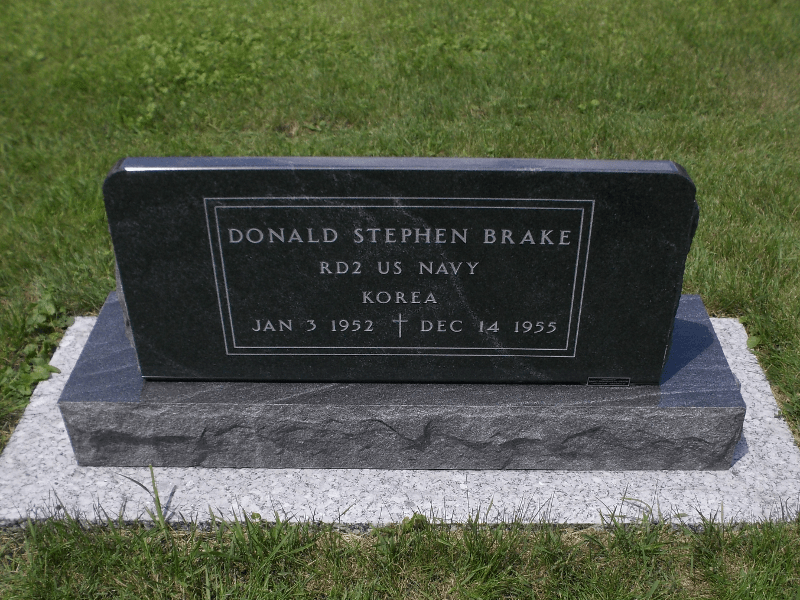 We want to take as much stress out of the monument purchasing process as possible for you! 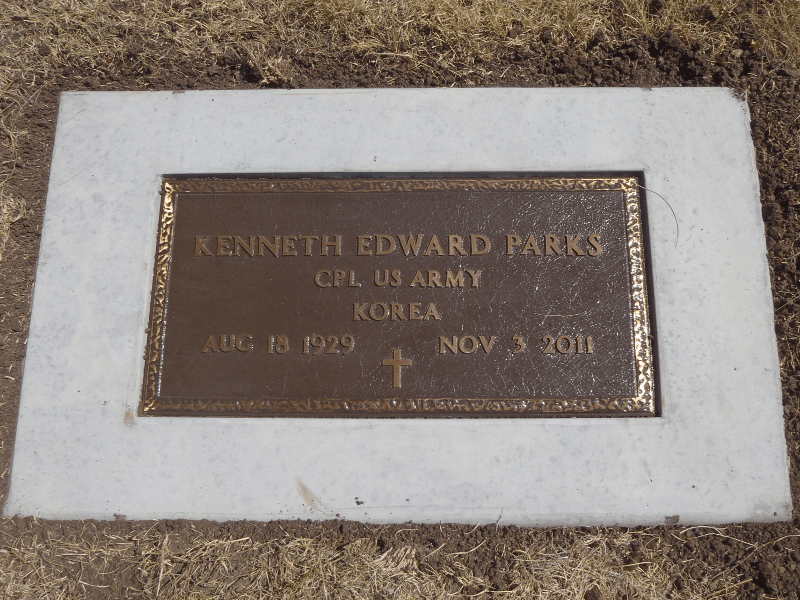 At Family Memorials we feel deeply honored every time a family chooses to trust us with the process of memorializing their loved one, especially when they are a veteran. We cherish every opportunity to work with veterans and their families and would love to work with you. 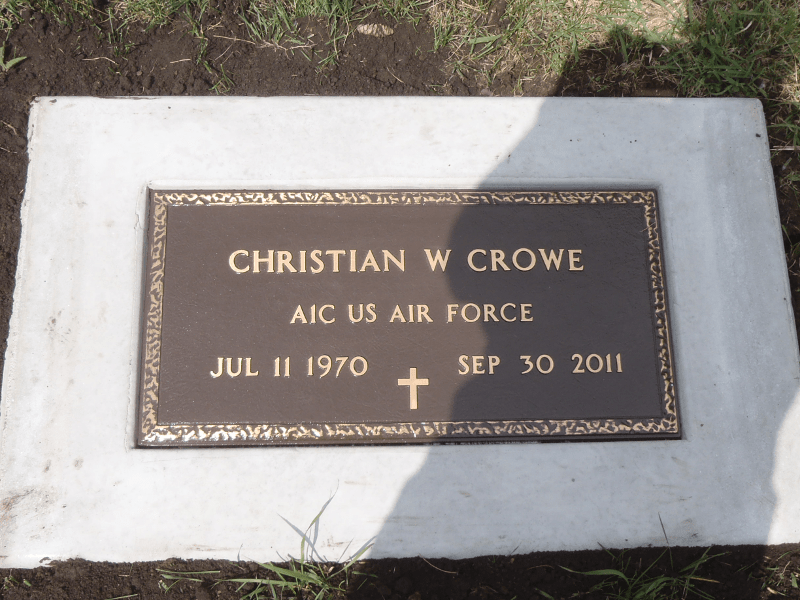 Our desire is to give every veteran we serve the memorial stone they deserve, a stone that tells their life story while, at the same time, recognizing their years of service to our country. We have offices in Sioux Falls, Rapid City, Watertown, Yankton, Chamberlain, and Pierre (all in South Dakota) and representatives in Minnesota, Iowa, Nebraska, and Wyoming! If you are in need of our services, please reach out to us so we can come alongside and help you memorialize your loved one. Give us a call now (1-800-658-2294)!